Cook the mince and chopped onion in a frying pan, then add the tomato sauce and mixed herbs. Simmer for a few minutes, stirring regularly. Fully cover the base and sides of the loaf tin with the bacon, placing them perpendicular to the walls of the loaf tin. 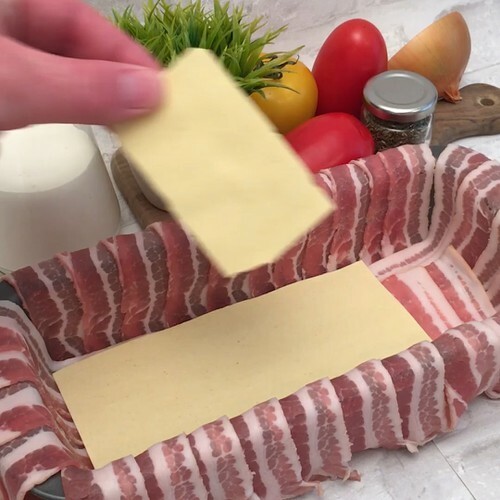 Place a layer of lasagne sheets on top of the bacon in the bottom of the tin. Add a layer of bechamel white sauce, a layer of grated mozzarella, and then a layer of the mince mix on top. Repeat the layers and finish with a layer of bechamel white sauce and grated mozzarella. Fold the ends of the bacon rashers over the mozzarella to close the ‘cake’ and bake for 45 minutes at 180°C. Once baked, turn it out the tin and enjoy hot.